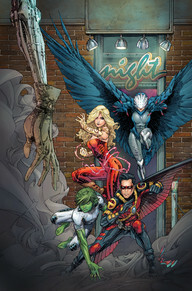 What I like about this Teen Titans re-launch is that it doesn’t undo what the previous series established. At least not completely. Gar has his old fun loving personality and green skin back while Raven’s darker personality and stoic attitude has a lighter side. Pfeifer has done a very good job writing this comic. His writing is very expressive and has a lot of interaction with the reader, giving the characters a lot of life. Take for instance each time he introduces the character. He writes “Raven…having the time of her life…Wonder Girl…not asleep. 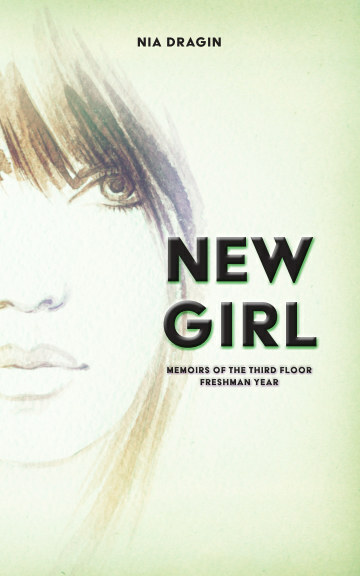 Not anymore.” It’s instances like that that are incredibly unique to his style of writing and make the third person narrative more captivating and capture the story and the characters. Then there is Rocafort, who is a phenomenal artist. His angular finishes and shading defines the issue ad gives it a lot of depth. Additionally, he gives both Raven and Wonder Girl’s new costume more texture that shows who they are. Raven looks more frightening and like a rave with the feather accents while the gold on Wonder Girls silent armor makes it unique. I love my Teen Titans. Ever since issue one of Justice League United, Lemire has been building up to the mystery behind Miiyahbin and who she is. Not only that, but there is the fact that readers were given the chance to understand her and how she is going to fit into the series. 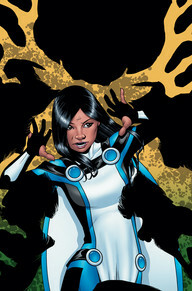 However, Lemire has made his goal to make her the central focus in this issue and readers discover how her power works. This issue has also established Alanna as a superhero alongside her estranged boyfriend (by necessity not choice). Lemire has built a very strong and fun dynamic between the characters in this series. This is the team that should have been the JLA. Lemire adds all the humor that is needed to make this team work and give it the life it needs to captivate readers.